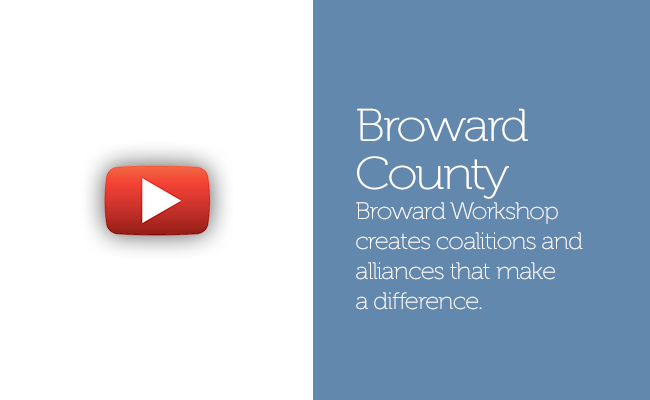 The Broward Workshop is a private, non-profit, non-partisan business organization comprised of the chief decision makers representing 100 of Broward County's business and professions seeking to facilitate solutions to our most critical issues. The Broward Workshop membership reaches out to foster cooperation between the private and public sectors as well as all socio-economic and political lines. They seek alliances to make a difference in the key areas that are important to all of our residents and businesses. Our members are diverse. They are a cross-section of leaders who span the four corners of the county and bring varied backgrounds, political affiliations, and points of view. They seek to represent the voice of all of our residents. Our members are small business owners, Presidents of mid-sized companies, leaders of the community and some represent the largest employers in the county. Each member brings with her or him a passion for making a positive impact and building a better tomorrow for Broward. Our members are dedicated. Their vision is broad. They are role models who lead companies, give to charitable causes and individually make a difference. Collectively, they come together to donate their time and energy united by a single belief - by building a stronger Broward; we build a brighter future for everyone.